Whether you need the free Audible app for your iPhone or iPod touch boils down to a simple question: Do you just want to listen to your audiobooks? Or do you want to engage them? 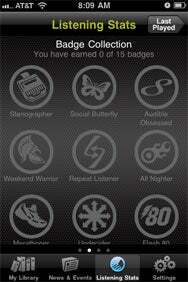 Good Listener: Audible’s iPhone app lets you earn ‘merit badges’ based on your audiobook listening patterns. If your purpose is the former, then you don’t need the app—even if you’re an avid subscriber to Audible.com’s audiobook subscription service, which is kind of a digital version of the old Book-Of-The-Month-Club. Yes, the app lets you listen to your audiobooks and flip back-and-forth between chapters. And if your device runs iOS 4, you can even listen to those books in the background while checking your e-mail or using other programs. You can also bookmark key moments of audio within the book, but otherwise the app’s audio features don’t offer anything that you can’t get with the built-in iPod application. What makes the app fun, though, is its interactivity. You can use it to tell people about the audiobooks you’re listening to, with options to share the information via e-mail, Facebook or Twitter. This feature would be even more useful if you could include a link to an audio excerpt of your selection—giving your friends a taste of the book you’re enjoying might encourage them to buy it, too—but Audible doesn’t provide that option. You can also use the app to track how much time you’ve spent listening to your books. Audible tracks your listening time down to the minute, awarding you statuses ranging from “AppNovice,” for 100 hours of listening time, all the way to “AppMaster” after 2,000 hours. You can also earn “merit badges”—such as “Weekened Warrior” or “All Nighter”—depending on your listening patterns. These features can be enjoyable; whether they actually enhance the audiobook experience is probably up to individual users. But there’s a critical flaw to the Audible.com app that can’t be overlooked: it provides you with no way to obtain new audiobooks or even browse the Audible.com library. You can download books that you already selected at the Audible.com site, but there’s no link to the site within the app itself. This is a curious omission, since Audible.com touts itself as “an Amazon company”—and Amazon’s Kindle app makes it easy to jump to the company’s mobile site, browse, and buy new books while staying entirely on your iPhone. This can be done manually by using iPhone’s browser to log into Audible.com, of course, but it isn’t the kind of seamless experience that makes using Kindle so enjoyable. This flaw is all the more frustrating because the app includes a “News & Events” menu item touting the latest, best audiobook releases. Those short pitches often end by urging the reader to “head to Audible.com to learn more”—without providing a link. The drawbacks mean that the Audible.com app is, at this stage, more fun than useful. Die-hard lovers of audiobooks might want to wait for future versions before downloading the app; right now it’s a work in progress.